Here in Boston, we might not have the luxury of gorgeous weather 24/7, but that doesn’t mean we need to limit ourselves. And Boston-based startup OpenGym Company, which makes gym equipment easily accessible in urban outdoor parks, doesn’t want you to either. 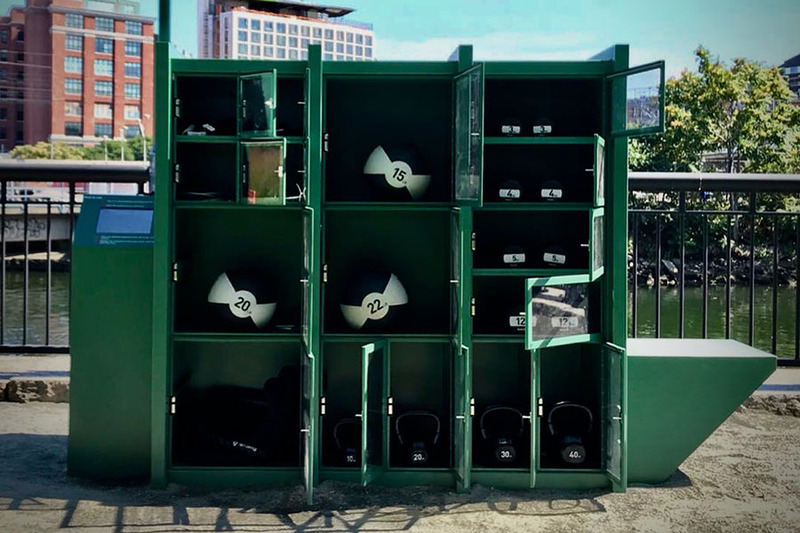 They’ve set up a fitness kiosk at the Underground Ink Block park right between the South End and South Boston and it’s full of kettlebells, dumbbells, battle ropes, jump ropes, medicine balls, and resistance bands. Best part? It’s free. Now you don’t have to force yourself to the gym—you can enjoy functional fitness equipment in the fresh air and sunshine. At least until the snow starts, of course. Co-founder Cody Otto, who started the company with his brother Jake Otto, says the system operates entirely through your phone. You simply create an account on the company’s website (app to come) which will communicate with the lockers to unlock the doors of the gym equipment you want to use. And if you don’t want to bring your phone with you while you’re getting your sweat on, you can access the equipment via the touch screen on the locker. When you’re done, you put the equipment back and shut the door. Sadly, the service won’t be free forever. Since this is only a trial period, because of the approaching winter, early members will not be charged, Otto explains. But the idea is to eventually move to a monthly subscription fee to use the gym equipment. The change will probably be implemented sometime next year and the cost will range between $10-$15/month, but is still TBD, Otto says. One bonus for fitness professionals: Local trainers have the option to sign up for a discounted membership to use the equipment to train clients. But before the service transitions to a paid product, current registrants will get a month’s notice, allowing them the chance to opt out. The service is taking some measures to protect against theft. 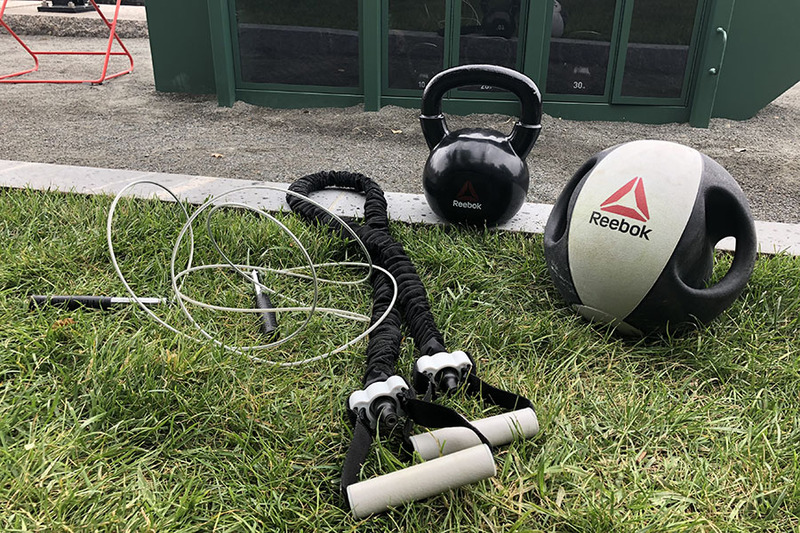 For the time being, a credit card is kept on file just in case one of the medicine balls go MIA, or the battle ropes end up looking like they were put through an actual battle. The software connected to the kiosk will be able to indicate who checked out the missing or ruined item last and an attempt to contact the person will be made before charging the card on file. And if you don’t know how to get started, the Otto brothers are hosting free workouts every Tuesday and Thursday by the kiosk at 6:30 p.m. so you can get some inspo for your next outdoor session. This Saturday, join them for an open house from 12 p.m.-4 p.m. where they will walk people through registration and use of the kiosk as well as give away free OpenGym gear. 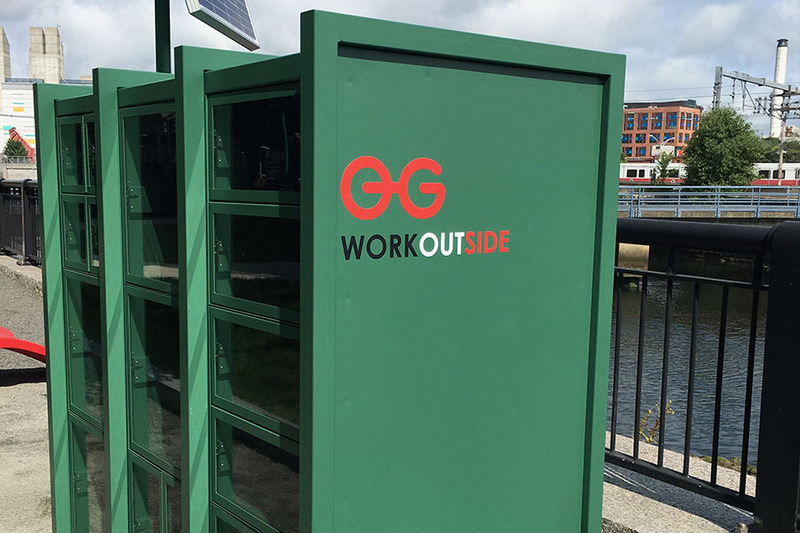 If you stop by, they’ll put you through a quick workout as well, utilizing the equipment, and discounts will be given for Reebok merchandise and Southie salad shop, Shredded. Free, 90 Traveler St., Boston, opengymcompany.com.